A Change of Perspective for Cognitive Science (G.P. Corcoran and A. Mehmet). Is Physics Reductionistic? (G.J. Dalenoort). Conditioning, the Basis of All Psychological Activity (P. Davies). On the Methodology of Clarifying Confusion (H.F. De Wit). There is Nothing More Practical Than a Good Theory'' (Kurt Lewin) - True or False? (H.J. Eysenck). Power Relations in Psychoanalytic Psychotherapy (S. Frosh). Systems, Causality, and Time: a Framework for the Integration of Theories of Schizophrenia (J. Gosling). 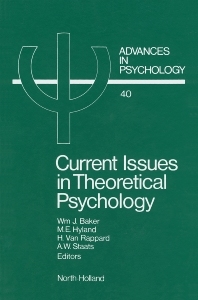 Psychology as Discourse: Towards a General Paradigm for Psychology Theory (R. Hammersley). Modularity, Mental Models and Tertiary Qualities (R. van Hezewijk). Symbols in the Mind: What are We Talking About? (R.J. Jorna). Ethnographic Discourse Analysis and J.B. Watson: the Behaviourist as Propagandist (A.D. Lovie). Theoretical Psychology: a Definition and Systematic Classification (K.B. Madsen). The Historical Approach of Critical Psychology: Another Case of `Paradigm Promotion'? (W. Maiers). The composition of the Ego in a Determinist Psychology (J.R. Maze). Pathological Subconscious and Irrational Determinism in the Social Psychology of the Crowd: the Legacy of Gustave LeBon (G.R. McGuire). Toward a Theory of Life-Span Development (R.S. Noble). The Social Status of Mentalistic Constructs (I. Parker). The Concept of Telosponsivity: Answering an Unmet Need in Psychology (J.F. Rychlak). Methodocentricity, Theoretical Sterility, and the Socio-Behavioural Sciences (M.L. Shames). The Rhetoric of Theory in Psychology (J. Shotter). Unified Positivism: Philosophy for Uninomic Psychology (A.W. Staats). Desynchrony Among Measures of Fear and Emotional Processing: Toward a Constructionist Perspective (H.J. Stam and K.L. McEwan). Model Disciplines, Research Traditions, and the Theoretical Unification of Psychology (P.J. van Strien). Ordinal Pattern Analysis: a Method for Assessing Theory-Data Fit (W. Thorngate). Intentionality, Meaning, and Evolution (C.W. Tolman). The Concept of Development and the Structure of Developmental Theories (P. Van Geert). Man-Machine Analogs and Theoretical Mainstreams in Psychology (P.A. Vroon).